Sydney (AFP) – Cutbacks to tuna fishing agreed at a crucial Pacific regional fisheries conference to prevent over-fishing have fallen short of expectations, the head of the fisheries management body said Saturday. Glenn Hurry, executive director of the Western and Central Pacific Fisheries Commission, said he was “disappointed” in the lack of teeth in the conservation plan adopted at the meeting in the Australian city of Cairns. The meeting agreed Friday to reduce the longline bigeye tuna catch by 10-30 percent for foreign fishing nations. 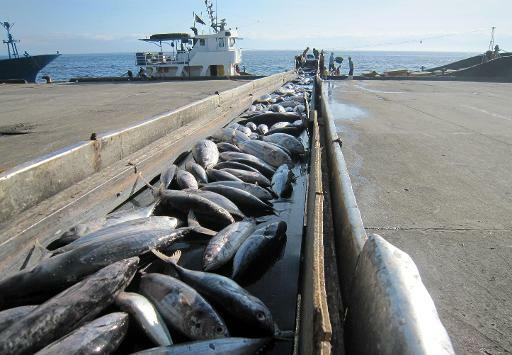 It also agreed to freeze the number of foreign purse seine and longline vessels targeting bigeye tuna for sashimi that can operate in the region. The commission will next year consider limits on purse seine fishing for after 2014. “I am disappointed that again it was a one-year measure… when we really needed a three-to-five-year measure with tough controls in it,” said Hurry. Island nations and environmentalists who attended the five-day conference also said the approved reductions would not prevent over-fishing. Transform Aqorau, director of a group of small island nations known as the Parties to the Nauru Agreement (PNA), said the progress made by the commission was “not enough to stop overfishing of bigeye tuna”. The PNA nations — Federated States of Micronesia, Kiribati, Marshall Islands, Nauru, Palau, Papua New Guinea, Solomon Islands and Tuvalu — control 50 percent of the world’s supply of skipjack, the most commonly canned tuna. A record 2.65 million tonnes of tuna was hauled from the Pacific last year, accounting for 60 percent of the global catch, with most of the fishing conducted by so-called “distant water” fleets from as far afield as Europe, the United States, China, South Korea, Japan and Taiwan. Island officials said the deal exempted vessels from European Union nations from a proposed ban on fish aggregating devices (FADs), which are objects used to attract tuna and increase catches. “Despite scientific advice that fishing of bigeye tuna needs to be cut by about 40 percent to return to sustainable levels, this week the WCPFC has not agreed on adequate action to do this,” Aqorau said. Solomon Islands delegate Edward Honiwala said the meeting, which relies on consensus, “failed in our responsibilities to adequately address the problems of overfishing” in waters where the tuna catch is a multi-billion dollar industry. The outcome of the meeting also drew an angry reaction from the Pew Environment Group. The Cairns meeting came a week after the International Commission for the Conservation of Atlantic Tunas (ICCAT) rejected pressure to increase quotas for bluefin tuna in the East Atlantic and Mediterranean. After marathon talks, the ICCAT concluded that the annual quotas would remain at 13,400 tonnes in the eastern Atlantic and 1,750 tonnes in the western Atlantic.